← 204 "Lard of the Dance"
"I've wasted half my life, Marge. Do you know how many memories I have? Three! Standing in line for a movie, having a key made, and sitting here talking to you. 38 years and that's all I have to show for it!" The living room becomes a movie theater, and the family sits behind various other characters. "The Wizard of Evergreen Terrace" is the second episode of season 10. "Homer experiences a mid-life crisis when he realizes, at 38.1 years of age, he hasn't accomplished anything meaningful. To curve his remorse, Homer decides to pattern himself after Thomas Edison and become the next great inventor." Homer is shocked to hear on the radio the average life expectancy for men is now 76.2 years, which makes him realize, at 38.1 years old, his life is half over. When he tells Marge this, she informs him he is actually 39. Homer realizes with time running out on his life, he hasn't accomplished anything, and this causes him to fall into a severe depression. Later when the family has a party to honor him, Lisa mentions Thomas Edison invented the film projector as well as many other inventions Homer uses. Homer learns more about Edison and eventually idolizes him. So in an attempt to follow in Edison's footsteps, he quits his job at the power plant to become an inventor. Homer gets to work and develops several inventions, such as an alarm beeping every three seconds when everything is OK, a shotgun which shoots make-up onto women's faces, a very difficult to control electric hammer, and a reclining chair which has a built-in toilet. But none of these inventions is well received. Feeling despondent over his failure to invent anything useful, his invention career is saved when he reveals he added two hinged legs to a chair making it impossible to tip over backwards. 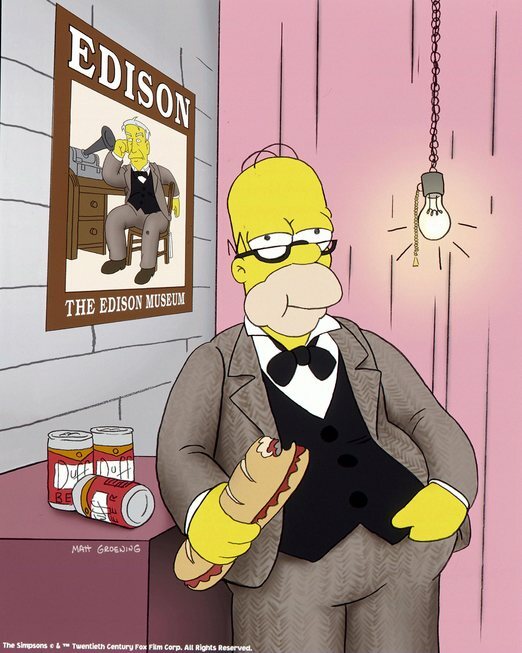 However, his hopes are dashed when he notices his poster of Edison shows his idol sitting in the same type of chair, which indicates Edison has already invented Homer's untippable chair. But Homer also finds out no one else has seen the extra legs on Edison's chair, thus Edison has never received public credit for inventing it. So he sets out with Bart and his electric hammer to the Edison Museum in New Jersey to destroy the chair. While on the way, Thomas Edison, as a ghost, appears and tells Homer he's only gonna hurt himself if he smashes his chair but Homer runs over him. Before he smashes the chair, Homer notices a poster of Edison's which reveals Edison idolized Leonardo da Vinci in the same way Homer idolizes Edison. It also shows Edison was never able to match da Vinci's accomplishments, just as Homer can not match Edison's. Feeling a renewed connection to his hero Edison, Homer decides not to destroy the chair after all. Unfortunately for Homer, he accidentally leaves his Electric Hammer at the museum. Later on the news, Kent Brockman announces the chair and the electric hammer, have just been discovered in his museum and is expected to generate millions for Edison's already wealthy heirs. Then Bart says to Homer, "Wow, Sad, I have to say you're taking this rather well." 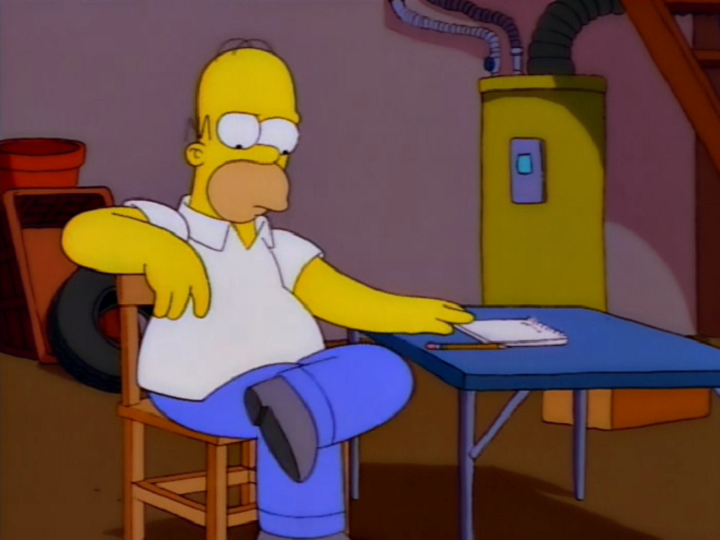 Then Homer says "let's just say I'm sitting in the right chair", while he sits on his Lazy Man Toilet Seat. Modified on July 9, 2017, at 01:35.